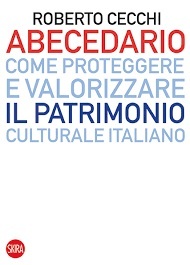 Abecedario is the new book written by Roberto Cecchi, architect and former Undersecretary of the Italian Ministry of Culture Heritage and Activities and Tourism, published by Skira. The book faces topics that are extremely interesting as well as relevant for the future of our Cultural Heritage. For this reason, we have the pleasure to publish an excerpt of an interview with the author about the book, and in a wider perspective, about the future of our Cultural Heritage. I would like to start this interview with a simple question: why you decided to write this book? It’s quite simple, indeed. There are some things in this book that I couldn’t write during my mandate within the Public Administration for both non-disclosure-agreement rules and for communication needs. Leaving the administration, and thus, leaving my direct responsibilities, I’m now again a free thinker and it is in such a role that I speak in my book. Furthermore, many of the arguments included in the book has been the subject of various articles that I wrote in the beginning of my mandate. I tried to change many of the topics but unfortunately I drew a blank. One of the things that most shocked me, is the great budget rigidity shown by the balance of the MIBACT, where most of the available resources for culture are addressed to human resources with little margin of manoeuvre. In your opinion, are there policies that could improve these conditions, beyond the increasing of the economic resources addressed to the MIBACT? Actually, the MIBACT benefits of remarkable economic resources, now, but this is not the central point. If we think that the ministry manages more than 460 museums, and there are also the headquarters, the offices, the overall budget of the MIBACT, compared with other countries (a. e. France) is completely irrelevant. The rigidity is finally due to inescapable fixed costs that cannot be changed. On the contrary, they are maybe few: if we think that the Colosseo is managed by thirty persons on a two shift basis, and that the Colosseo is considered the second museum in the world, we have a clear idea of what we are talking about. In a few words, we need to make the Public Administration able to operate, not only in restoration activities but also in the business as usual procedures. Regarding this topic, in the book you mention the ratio between the tasks that the MIBACT has to complete and the human resources on which it can count on. Particularly, in the book you affirm that the human resources are overloaded. What is the solution? Actually, this is a hard situation. The solution is the creation of the “rule of the game”. The situation is so unbalanced that even assuming the triple of the human resources would be unhelpful. Neither the Ministry nor someone else could help us to solve the situation. The only solution is to create new rules of the game and close, definitely, the season of the “presunzione di culturalità” . We need to know, exactly, what, when, how and why a single good, whether monument, a painting or a landscape are protected by law. Being aware of this, the activity of the Ministry becomes more efficient. In the book I report that between 2002 and 2004, the superintendence led almost 45.000 verification of the cultural status of single objects, declaring as cultural only one third of the cases. This means, thus, that in two third of cases the Ministry has been involved in a useless work. Significantly, establishing the criteria that describe a cultural good could help us in improving the efficiency and the effectiveness of the Ministry. Indeed. Recent reforms, actually, would like to state that the problem is represented by workers, but this is not true. Characteristics such as efficiency of a system are strongly affected by the laws that rule that system. Our Ministry needs new set of rules. In this sense, a large part of cultural operators feel that the current government is not following a strategic line, but it is acting without a specific path. Do you think this perception relies on a true basis? For sure, this government took several decisions, and these decisions are very precise. Nevertheless, the fundaments of some of these decisions are difficult to see. For what concerns the cultural system, my feeling is that the current government is trying to weaken the tutelage level, by confusing the jumbled tutelage system with the persons that work within the Ministry. Do you think that there is somebody within our cultural public administration able to design a medium-period development path? In other words, the current government can, in your opinion, count on a figure able to create a development strategy? Actually, I think that the Ministry, and the overall structure, is not the solution of the problem. I think they can become the solution of the problem once we establish, exactly, which is the problem. They cannot be the solution before of the diagnosis. In this sense, the diagnosis should originate from the public debate, and from the analyses of experts and practitioners. I don’t see this debate as I don’t see an in-depth public analysis about the role and the meaning of the tutelage or the development of cultural goods. Regarding the public debate, I notice that there are several campaigns about some political and economic restrictions. Who is active in this debate believe that these restrictions could limit the development of the cultural sector, intended both in the economic acceptation and in the fruition meaning. For example, do you think that the fiscal policy that rules the art system in our country is well designed? We did enough! In 1982, there was a wonderful law ruling the fiscal policy of cultural system. With this law, Italy was in the vanguard of the world about this topic. This law designed fiscal reductions and facilitations for the management and the development of the cultural system that were unique . Later, with as time passes, and above all because of the circularity of the different Ministries, this law has been wear away. We were far far away the Artbonus  . Well, I have clear ideas about the Artbonus, and I think we have the same position about it. What about the notification of the declaration of cultural interest ? The notification of the declaration of cultural interest is a choice of the MIBACT, it’s not important the way in which the notification is done, but it is essential to understand what the MIBACT has to protect. Finally, I would like to ask you what is your cultural vision for the next three years? What do you think our Government should work for? Which are the matter of interest? The law. The design of new laws. In Italy, the laws come after things were made. The laws, by which we operate, were approved in 1909 and they are an interpretation of the laws declared in 1902. In that year, in fact, with the first law for the protection of cultural heritage our government decided to establish a task of protection for the monuments and fine arts office. In 1902 the monuments and fine arts office created a catalogue of objects in order to preserve them. The catalogue included hundreds of items, but in the following years the catalogue was interrupted and the result was a loss of our cultural heritage. In order to avoid that loss, in 1909 the new law for the preservation of cultural heritage was based on the “presunzione di culturalità”. In certain conditions, in fact, a place, or a building are presumed as culturally relevant only because are property of the Church or of the Government. These assets live a particular condition: they are not fully protected, but every change or real estate actions need the special authorization. In 1985, the Galasso’s law implemented the same principle for the landscape. That law protects places within 300 meters from the sea shore and within 150 meters from the river bank. We don’t know how these places are protected and so, some years ago, it was approved a new law for the restriction of protection. Nowadays, the protection has to be justified. However, in Italy we have waited 30 years in order to move from the superficiality of protection to the identification of the reasons of protection. In conclusion, we have to decide what we have to protect and what we don’t have to protect. Many words to return to the starting point: the construction of the rules game. Italian laws state that in certain conditions a place, or a building are presumed as culturally relevant. In thes cases every change or real estate actions need the special authorization. In the book, it is fully described how this presumption affect the overall efficiency of the Ministry. Abecedario. Come Proteggere e Valorizzare il Patrimonio Culturale Italiano.